But before that, disclosure: I did not purchase NARS Douce France. Pink eyeshadows are a rarity in my collection, largely because having one really is enough in my book. 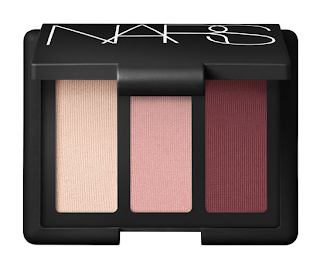 A few days ago, I asked on Twitter what everyone would like to see first from NARS Spring on Messy Wands. The overwhelming immediate response was "Douce France" (I'm sorry, but am I the only one who keeps seeing "douce" as "douche"?) but I didn't have it then. Since so many people was curious about it, I thought I should at least go to a counter and check it out myself. Besides, one of my readers (hi, Mikki!) has been telling me forever about this fantastic NARS counter manager in Barney's that I had to meet. So I went, and Sasha instantly became one of my new favorite SAs. I told her I wanted to try out Douce France and gave her free reins on application. 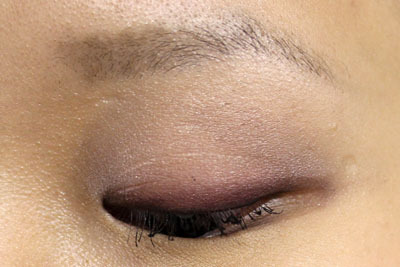 First she primed the eye area with NARS Eye Shadow Base, then she placed the lightest shade all over the eyelid. 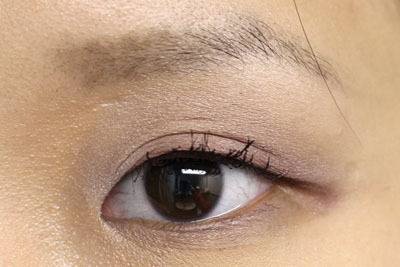 This is followed by a more precise application of the middle pink shade over the eyelid and Lhasa lightly blended into the crease. She smudged the brick rose shade near the upper lash line and applied a thinner, wet line of Coconut Grove on top to create the gradient you see in the pictures below. She thought this last step was crucial and I agree. I believe the exact sentiment was "otherwise you'll look like you have pink eye." So... my lips are patchy and my nose is dry. Anyone has a great moisturizer for the nose to recommend? On lips: NARS Mexican Rose layered with NARS Larger Than Life Lip Gloss in Born This Way, layered with Le Métier de Beauté Peche Creme, layered with Sunday Riley Cherry Pie. I'm treating lip layering like my winter outfits. Also messiness (ha!) was my dinner's fault, not Sasha's. I think this is a great natural spring look. My mind inadvertently goes to green fields and dandelions and budding flowers when I see these colors. It is also an option for those who are looking to make Douce France "usable." But Sasha said she knew I wasn't going to get it as soon as she put the first shade on me, and I knew it too. I'm just not a pink girl, I suppose. NARS Douce France retails for $45 and is available at major department stores and narscosmetics.com. If you need makeup recommendations or just someone fun to talk to while you shop, give Sasha a call at 212-833-2008 and let her know I sent you! Quite a pretty look! I'm still chicken though! Thank you so much for this - such a great look! I love the idea of the palette but had no idea how to wear it - now I do! I read on Beautezine a while ago that the trick to pull off pink shadows is to do a thicker eyeliner, but I still avoided the challenge by getting Paramaribo instead of this one :p It looks great on you! Very soft, feminine, and spring-y! I have very dry skin and dry patches, especially on my nose!, are always a nuisance in the winter time. My fix is Bobbi Brown's Extra Soothing Balm. It has the texture of a salve but it's not heavy or greasy at all and plays well with makeup. A little bit is all you need. You can use it anywhere - face, cuticles, I have eczema too so I use it on patches on my arms and legs sometimes. It's good stuff. Sasha is an AMAZING makeup artist! She's done so many fabulous looks on me and is lovely as well. It looks really nice... however, I'm not really a pink eyeshadow girl either... I have a quad from Guerlain, and like it but don't use it that often. I think I will skip this trio, and just stay with Mexican Rose and Paramaibo... and Gaiety I think. Thanks for your entry on Douce France! I do see "douce" as "douche" or "dolce" a lot lol. I bought this trio together with lhasa and I think they work well with one another. Normally I am not a "pink" fanatic, but I guess I will give this a try. Worst case, I will use this as a blush. So pretty! I also definitely read 'douche' each and every time and have a little chuckle. I didn't pick this up when I grabbed the rest of the spring collection and I'm now wishing I had. The colours translate so well onto the skin. Love!